Brace yourself, Dreamers, because Dreamstate is on the horizon. Some Americans will be spending their Memorial Day weekend drinking a chill beer and BBQ’ing with their immediate families, saluting the fallen soldiers that have given up their lives for our freedom. However, for some of us in San Francisco, we’ll be honoring those with our extended Trance Families at the Bill Graham Civic Auditorium on Saturday and Sunday. On Saturday, fans will hear from the likes of Ben Nicky, Liquid Ace (Liquid Soul & Ace Ventura), Markus Schulz Presents Dakota, Menno De Jong, Paul Oakenfold presents Generations, Paul Van Dyk, Purenrg (Solarstone & Giuseppe Ottaviani) and Ruben De Ronde. Hopefully, that powerhouse of a lineup doesn’t burn you out because Astrix, Binary Finary, Bryan Kearney, Ferry Corsten, Fleming & Lawrence, Gareth Emery, John O’Callaghan and Vini Vici will be closing out Sunday. It’s honestly hard to say who I am most excited for. After missing his EDC set last year, Ben Nicky is one of the DJs that I am most thrilled to see on the opening night. The Englishman will be making his way from Chicago to The Bay to astonish us with his energetic style. If you enjoyed his set last year or like banging your head to his Headf**k Radio, then you have to check him out. Make sure your trance-pants are on tight enough, so they don’t slip off while you’re jumping away. I know this is cheesy, but I am excited for Gareth Emery on Sunday. Yes, yes, yes, I know there are many DJs on this day that are just as good or, if not, better than someone whom I’ve seen many times before. However, there’s something about closing out a trance festival with a man who knows how to put together a perfect combination of uplifting melodies and touching lyrics. For us who have listened to his single “Saving Light” (a collaboration with Standerwick featuring Haliene) on repeat knows that it just feels sooooooo gooooood. If closing out another festival with Emery makes me a basic bro, then I will wear my tank top and indoor stunna shades with pride. #PLUR. 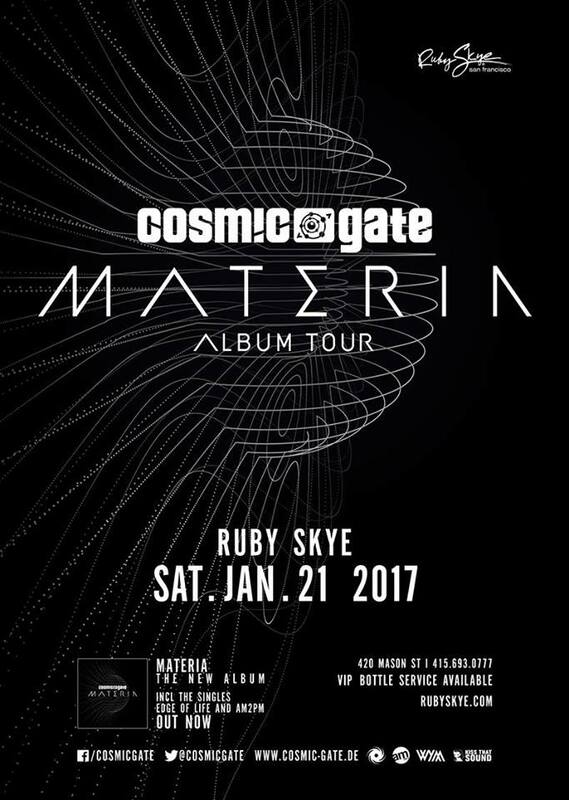 For those who want to keep the party going Saturday night, the Dreamstate After Party hosted by the Phoria Events team at Ruby Skye. Local acts Alastair James, Joseph Martinez, Dmitri Reign and Jonny Atom will open the stage for the legendary Simon Patterson. Phoria’s headmaster, Niko Zografos, will close out the evening (or late morning depending on how hard you wanna party for THE LAST TRANCE SHOW AT RUBY SKYE!!!). What started out as an answer to the cries of trance fans for a stage that represents their taste in euphoric music and psychedelic synths have metamorph into a festival phenomenon. Compared to big room house or bass music, trance is a sound that everyone can find the warmth of a community, a sense of home for those who have felt like outcasts. Its survival and current zeitgeist in electronic music is a testament its success. PS, on the topic of Memorial Day, I want to pay my respect to Rober Miles. I have danced my fat Asian a$$ to “Children” many of times on the DDR machine, and I know the Trance Family will be feeling the lost of a legend. Watch out St. Patrick’s Day, San Francisco has another big event in March! The local trance promotion company Phoria Events will be celebrating their three year anniversary on Friday, the 10th, with REORDER’s SF debut, Indecent Noise’s “Hard Trance Classics,” and the legendary John Askew closing off the night. We have seen some changes in the scene since the launch of Phoria. 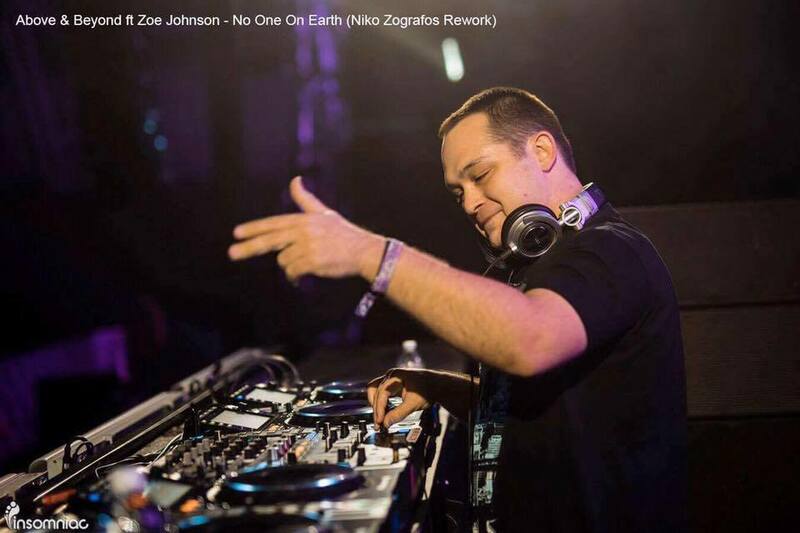 So to make sense of our evolution as a premier name for trance in The Bay, Niko Zografos (the head honcho) is here to answer some questions for us. Since starting the company three years ago, did you expect Phoria to gain the acknowledgment and success it has now? Just about how many members are on the team? It’s definitely been awesome to see Phoria grow. The San Francisco trance fans have always been passionate. The growth has definitely been exciting. We have about 15 promoters and DJs. It’s a small, close-knit group. When you first started Phoria, how did you think your company would compare to TFSF? Can you describe your relationship with TFSF? Well, I work very closely with TFSF, and I think it’s really awesome our end goal is the same: growing SF’s trance scene. We’ve done quite a few of events together over the past and alway fully support each other’s events. Do you feel that your bookings requirement have changed within the last three years? Would you ever consider booking a DJ that is a little more house than trance? Or, maybe a trap DJ? Just kidding. Haha, I think my booking ideas have been pretty consistent over the past three years. I want to bring the best trance possible. This includes new artists that have never or rarely played SF. I love progressive, techno, and psy, so you’ll definitely see that influence in the artists we bring out and support. Have fans ever expressed negative feelings or comments on some of the bookings at shows? How should fans voice their opinions for future bookings or their opinions for Phoria? I’d like to think there isn’t much negativity overall. I definitely feel it’s important to have a variety of different styles of trance so appease different fan bases. Any fans should definitely reach out and speak out with their opinions, good and bad, because we do this for them! Have your feelings for trance music change since being in the business? Or, how do you feel the industry is now, considering what you know from working in the industry? My feelings and passion for trance have grown. I love what I have learned thus far. The behind-the-scene stuff is definitely where a lot of the magic happens. The industry is always evolving and growing. It’s important to stay smart and on top of everything that is happening in the world of trance. Trance has recently entered more of a mainstream light. DJs who have left the scene are returning. How do you feel about the trance scene now? Will Phoria take that into consideration when booking them? Who do you want to return to take the stage again at Phoria? This seems to be a question asked a lot lately, and I feel that it’s great more people are getting into trance. This (the scene) is all about sharing music and having a good time. I’m excited to hear about some of the names returning to trance. Good music is good music, and I’m always on the hunt for that. I’m definitely open to booking any artist I think will help create a great experience for trance fans and of course has some great and exciting new music. What are some of your most fun/favorite memories working at Phoria? So many great memories! A few that definitely stand out are Open Up 100 with Simon Patterson & Jordan Suckley, Markus Schulz Open To Close, Ferry Corsten on a few occasions, our first event at Slide with Ilan Bluestone, then, of course, our first event at Ruby with him and Jerome Isma-ae and more. Slide was a great start for intimate shows for us, so there was definitely some special times there along with, of course, now countless special times at Ruby, with a few notable ones like FSOE Night at Verso. What is one of the most difficult challenges you have faced while running Phoria? Did you have any fears? Definitely, the most difficult challenge has been balancing Phoria Events with my music career. Not really much fears but at the same time, I always want to strive for each event to be as successful as possible. How do you know when to perform at one of the Phoria nights? Is there a line that separates you as a promoter and DJ? There is definitely a line that separates me from a promoter and a DJ. I don’t want to play often for two reasons; one is that I’m not a local openers/support act anymore so, two is it has to be the right night. For example, a good time for me to play was FSOE Club Night. When would you say was the moment that made you realized that Phoria became a name people recognized and looked to for trance events? Tough to say really because I feel like we’d had success from the start, but at the same time there have been some struggles in the beginning, too. I think it’s important to always be better than you were the day before. And if you aren’t doing that, you have a bigger chance of losing your success. When fans leave a Phoria event, what is the one thing you want them to take away from their experience? It’s all about the music! I want fans to have their passion for trance growing or for new fans to begin their journey into trance because of their experience at our events. Do you have any words for EDM fans out there who are hesitant about attending a Phoria show? Do you feel like you have reached some of your original goals for Phoria? What are some goals you still wish to achieve? Any big news we should know from the Phoria team? Maybe we will see a Phoria festival or something? We definitely have reached some of our goals, and I’m definitely proud that! I think it’s important we grow our events as much as possible and to make them more special each time. Well, there you have it, folks, words from the man himself. The night should be an intense one, as most birthday celebrations are. Make sure you’re there to join us for a dance party that will leave you breathless and your trance-pants soaked with sweat! Let’s also give a shout out to SF’s very own DJ Blurr for providing the local flavor of the night. The weekend is here again and we are excited to provide the stage for two Southern California DJs. No need for introductions for the legend BT as he will be coming in hot after releasing his new EP All Hail The Silence. 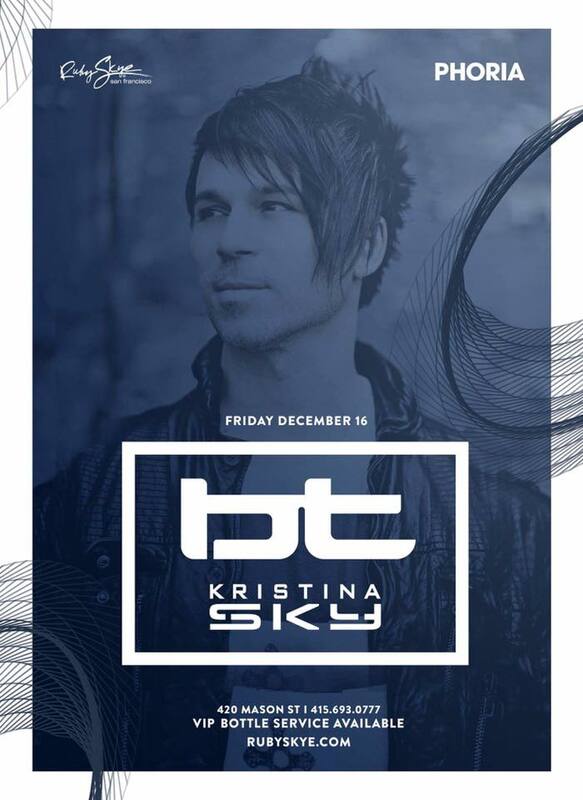 We have another Dreamstate participant tonight with Kristina Sky. If you haven’t listened to her set then give it a go, you won’t be disapointed. 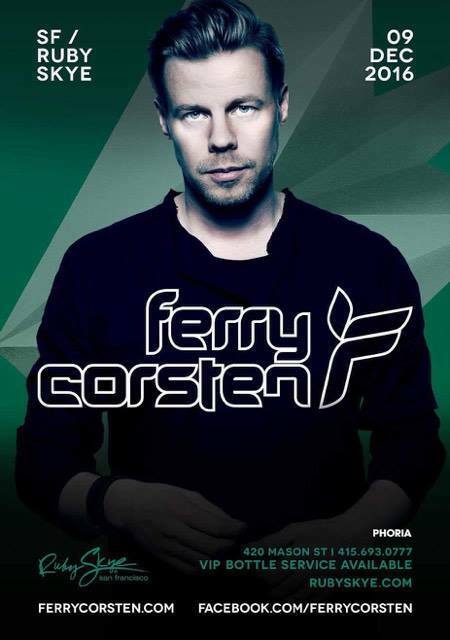 Hot from his Gouryella set at the SoCal Dreamstate, Ferry Corsten will be bringing the holiday warmth from The Dream Stage to the cold San Francisco night this Friday. Many trance fans will need some uplifting trance before the chaos of S.F. SantaCon, an annual event where a bunch of loose Santas drunkenly roam the holiday streets of The City. Of course this event isn’t related to red coats and limp Santahats, but this is still an event to attend. With local support from Billy Horn and Jonny Atom, Phoria has a lovely evening waiting for you with aspiring talents and superstar DJs alike. So come, my friends, if you’re looking for a night to party, an evening of euphoric feelz or just a simple place for shelter on the eve of the Santa pandemonium this weekend. This is a great way to start off your December, with a healthy helping of Trance from our Phoria family to yours. This Saturday, Phoria presents Super8 & Tab + Jerome Isma-Ae at Ruby Skye with local support by Erika K and Alastair James. 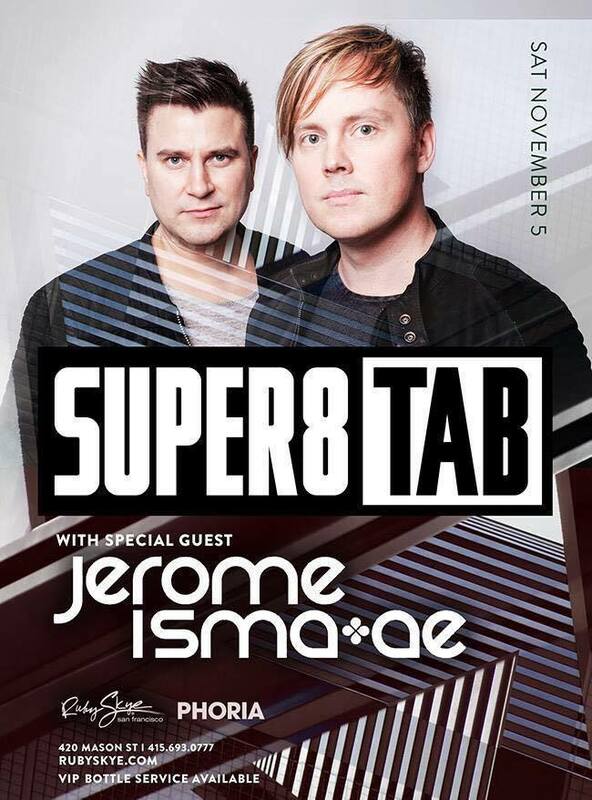 The Finnish duo Super8 & Tab will be joining us fresh from their adventures on the Groove Cruise Cabo. Their hit “NINO” has been rocking ASOT listeners since its release and it was sure tune that rocked the boat. Jerome Isma-Ae is no stranger to the Phoria community as he will be coming in dark and HOT! this Saturday night. The German man turned heads and gave the world a pulsing remix of Orkidea’s “NANA.” His recent collaboration with Alastor, “Reflection,” also reached the number 3 spot. The combination of progressive sounds and uplifting trance seems fitting for the weekend after Halloween as we transition into a more thankful holiday. Make sure you catch both of them once you neatly tuck away your costumes, or wear ’em again for this night, either or.